is the first and only affordable, non-invasive, and completely reversible dental treatment that can quickly get you feeling better about your smile and your life... in just about 3 weeks. NO SHOTS! NO DRILLING! NO ADHESIVES! YOU CAN EVEN EAT WITH IT! 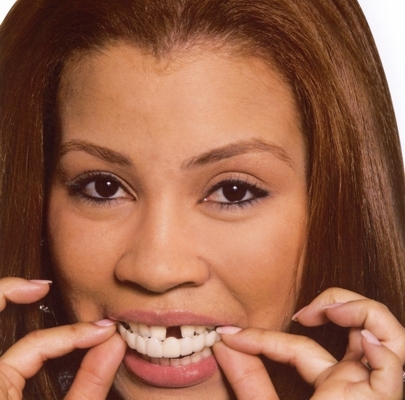 Snap-On Smile was invented by restorative dentist, Dr. Marc Liechtung, who recognized that not all patients can receive permanent improvements to their smiles and overall health with dental restorations such as crowns, veneers and implants. He strove to create an attractive, comfortable, and affordable solution that was easy for patients to use. After eight years of research, Dr. Liechtung created the patented Snap-On Smile appliance that simply snaps in and out over patients' natural teeth. Made of very thin, but extremely strong, specialized resin that resists staining, Snap-On Smile can be used for years or worn as a preview and covering over ongoing dental restorations. It should never come loose or fall out. The customized appliance is available for upper and lower teeth and is easy to care for with a special Snap-On Smile Care Kit that comes with your Snap-On Smile appliance. Snap-On Smile offers a simple, life-changing solution for many patients of all ages: those with crooked, stained or missing teeth or with gaps, patients who are not candidates for implants or bridges, people undergoing full-mouth reconstruction or implant procedures, patients who want to avoid shots and drilling, as well as those who simply want better functioning teeth quickly, or a preview of what dentistry has to offer. Thousands of patients worldwide have already experienced the benefits of Snap-On Smile. Ask for a Snap-On Smile appointment. The process is quick and painless. Dr. Goone will take photos and impressions of your teeth. You choose from different smile designs and shades for your Snap-On Smile. In two to three weeks, the exclusive lab at Snap-On Smile will create and send Dr. Goone your new appliance for final insertion. Snap it in and wear it home. Change your smile...change your life.